45 Years of Magic Kingdom = $45 Disney Gift Cards! 45 Years of the Magic Kingdom is turning into a unique opportunity for you! This month only, October 1-31, 2016, I’ve got a special offer just for you! This offer is for new bookings only, existing bookings are not eligible. This offer is for Walt Disney World vacation packages. A package consists of lodging at the Walt Disney World Resort and tickets. The Disney Dining Plan is optional. The amount of the new package must be $3,000 or greater. Your gift card will be included in your travel documents that you will receive from Pixie Vacations prior to your check-in. The travel must be for 2016 or 2017 Walt Disney World trips. You can submit a vacation quote request online. You can email me at Mike@PixieVacations.com. You can call or text me at 919-606-6725. You can send me a message on my Facebook Page. You can send me a tweet on Twitter. My family was fortunate enough to be able to celebrate the 40th anniversary of the Magic Kingdom, and while we aren’t able to be there for the 45th birthday, we want you to be able to celebrate for us! That’s why we are offering up our 45 Years of the Magic Kingdom special offer! This won’t last long, though, so make your plans now to take advantage of this offer! Once November is here, this offer is gone! 45 Years of the Magic Kingdom! October 1, 1971. 45 years ago today. A day that will live in the memories of all #Disney fans everywhere. It was on this day that the Magic Kingdom, the first park in the so called “Florida Project” that we know of as Walt Disney World, opened to the general public. On this day, I was a lad of just 3 years old, and had no idea of the significance of this day at the time. In fact, it wasn’t until eight years later that I would make that first trip to Walt Disney World, when my grandparents took me, my sister, and my Mom in 1979. Looking back over the many years, I realize that the truly incredible memories I have of this incredible place have helped to shape my life moving forward. Memories such as the time that Cinderella sent Sophie an enormous chocolate chip cookie just because. That memory helped fashion the dreams of a wonderfully innocent 6 year old, memories that she remembers to this day. 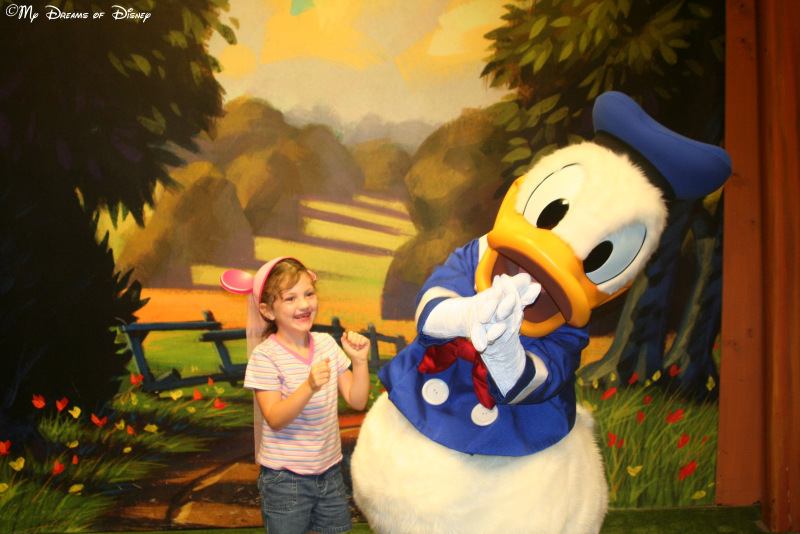 Sophie was so excited to see Donald Duck she started dancing! I could write for hours on the subject of what incredible times we’ve had at the Magic Kingdom, but for today, I’ll close with a look back at an event we were fortunate enough to be a part of five years ago — the 40th birthday of the Magic Kingdom. The beauty of that day was indescribable. I don’t think I’ve seen as blue a sky as I did that day, and the weather was absolutely incredible. Around 10 AM, they had a special parade from Town Square in Main Street, USA, down the street, and they had special presentations by Cinderella’s Castle. Our plan was simple, to ride as many of the original attractions from October 1st, 1971, as we could, and we did that and then some. The only bits of a hiccup to the day were at lunch time, when we were going to eat at Pinocchio Village Haus, but the line was out the door and around the block, so we went to the Columbia Harbour House and literally walked right in. The only other part that was bothersome was the absolute insanity of all of the people gathered for the fireworks that night. It was crazy, and we knew we just had to wait it out, each of us holding on to one another so we wouldn’t be separated. For this blogger, #45years of the Magic Kingdom has turned into #45000memories and counting. Let me know what your favorite Magic Kingdom memories are, and thanks for stopping by! If you are there, let me know what it’s like!